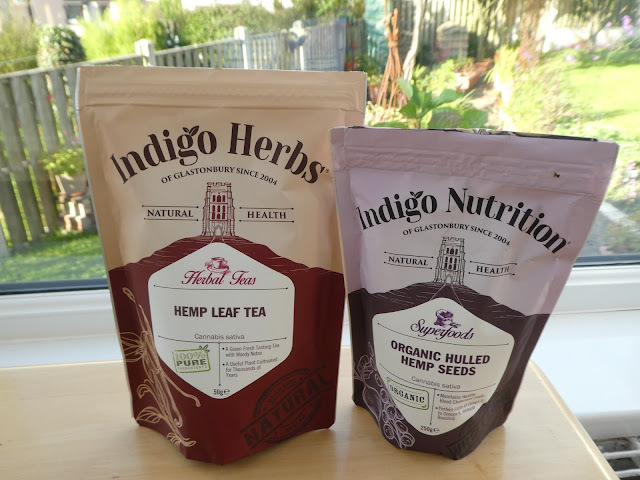 A couple of weeks ago I was fortunate enough to win an Indigo Herbs Hemp giveaway on Emma Cooper's blog, The Unconventional Garden. The giveaway was a packet of Organic Hulled Hemp Seeds and a packet of Hemp Leaf Tea. I entered as I'd heard that hemp was good for your immune system. Research suggests that Myalgic Encephalomyelitis (ME) is an auto-immune disease, so I thought it would be useful to add hemp to my diet. Up until now, I've been using Milled Flaxseed to increase the Omega 3 in my diet, via my morning yoghurt, muesli and nuts. For the last week or so I've been adding 2 teaspoons of the hulled hemp seeds to this, and am rather enjoying the taste. Obviously I cannot say if it's helped my immune system yet(! ), but as it's tasty, I'm happy to keep including it in my breakfast. Particularly as it's higher in iron, zinc and magnesium than the flaxseed, and has Omega 6 as well. The flaxseed still has more calcium, so I'm going to continue to use both. I wasn't sure if I would like the Hemp tea. I think in my head it made me think of nettle tea, which I just cannot stand, no matter how much sugar or honey (or both) I've added it it. But it's not like nettle tea at all. I'm not good at describing tastes, but it brings to mind a pleasant herbal tea, similar to peppermint, but with different flavours. Again, I like the taste of this product too. Will I continue to use these hemp products? Why yes, I will. I'm enjoying the taste and given the high nutritional value of hemp, the hulled hemp seeds are a good way of adding an important collection of vitamins and minerals to my diet. I'll be ordering more from Indigo Herbs in the future. Omega 3 & 6 are supposed to help my dry eye condition so I take Hyabak capsules and also Evening Primrose. It's always difficult to decide whether they are of benefit or not. I guess we will try anything won't we? Does it taste like anything else? It kind of reminds me of nettle, but much much nicer (to the power of 100!). Kind of woody. I add in a small amount of sugar and the overall flavour is lovely.